Sayen had returned to her feet quickly, but not quickly enough that she would have been able to catch her bounty before he'd made off. Thankfully her new compatriots were on the ball. Hassim was once again seated firmly in the dirt and Anakita was now tending to the raptor. The report of the man's abuse of his mount was most distressing. She couldn't imagine mistreating her mount. He was an intelligent creature - he rode with her as one - like minded and with the same goals. Almost as if he were tapped into the Dream as well, though Sayen knew that was well-nigh impossible. Well, probably impossible. The sylvari strolled over to where Hassim lay in the dirt - Shrike standing over him with a sword to his neck. She stood quite close and looked from the man's terrified eyes, up the length of the sword to Shrike's intense face, then back down to the felon. "You know, the bounty didn't say 'dead or alive'," Sayen started thoughtfully, "but I don't think they'd really mind either way." Hassim's face grew even paler and he swallowed carefully, keenly aware of the trickle of blood running down his neck. He lifted his left hand slightly, fingers splayed. "H...hey now. Outlander, you are not aware of our customs..." The man let out a terrified squeal as Shrike's blade pressed in. "Of..of course. My apologies...oh wise and benevolent...raptor. There...now, you let me live, yes?" Hassim's voice shook with fear even as he gestured to Anakita. "If you want the animal take him, and blessings. He has given me nothing but trouble..." The man seemed to want to go on, but one more look at the pirate in front of him seemed to make him change his mind. "I am ready for you to take me in, Outlander. Just...get me out of here!" The raptor settled as Anakita approached, but continued to flinch and keep its eyes on Hassim - until the man released him. Immediately, the huge reptile relaxed. His head swung around to regard Anakita once more and he shifted to bring his body closer to her. He seemed to want something from her, but what? Anakita stroked the raptor's neck, and she moved her own body closer as the raptor did so they were leaning on each other. "Do you want to come live with me?" Anakita asked, talking to the animal as though he were another person. "We have a nice house. There are some other raptors there. They're a lot smaller than you, but I think you could be friends." The Ranger's dreams of having her own mini-army of Pocket Raptors had finally come to fruition in recent months. The tiny raptors had not been particularly hard to train - though their combat applications had been limited so far, because Anakita had fretted too much about them getting hurt. "There's food to eat, and I promise no one will beat you. What do you think?" Although the creature was not capable of human speech, Anakita waited, seeming to expect an actual answer. Last edited by Monkey Kitty; 02-12-2018 at 04:27 PM. Shrike’s eye brow rose in amusement as she looked at the Sylvari out of the corner of her eye. She liked this one and if there wasn’t this gnawing feeling of guilt for thinking about it, she’d ask the Sylvari to join her on her journey. She could open up her world in ways she couldn’t imagine, but the throught that it wasn’t a good idea struck her hard and the amused look on her face faltered for just a moment. She withdrew her blade and looked directly at the Sylvari. She didn’t need to watch Hassim, Rinoa was doing an excellent job of it, as well as the other cats in their presence. Shrike finally sheathed her sword and held out a gloved hand to the Sylvari. She needed to cut this short, she had things to do and the pressing urge to get on her way. Trouble was brewing with her mother and siblings, and she needed to get off this planet. The raptor chirruped and sat down heavily, curling its tail around Anakita and barely missing Azh's tail as it did so. It used its back leg to scratch behind its ear, then turned its head toward the Ranger. It would seem as though the huge reptile were smiling. Sayen took Shrike's hand and pumped it enthusiastically. "The name's Sayen Nekane and I think your hat is the most fantastic thing I've ever seen! What kind of a feather is that? Do you know that it reminds me of a buccaneer's hat? You must be from south of Divinity's Reach! I mean, what with the sword and all. Not that it's not a nice sword, far from it, but the sabre has it's own flair, doesn't it? I think it does. Of course, people don't think I'm from the Grove simply because of my mace! Hahahaha!" The sylvari finished her long-winded introduction with a belly laugh that sounded more like someone beating a triangle with a large stick than what one would expect from the physical appearance of the laugh. Sayen had wrapped an arm around her waist and was nearly bent double. Still, even as she laughed, something niggled at her. Something important. When she'd said the word 'buccaneer', to be more precise. 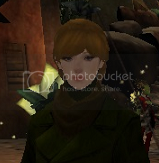 The Sylvari glanced sideways at Shrike, suddenly serious - and just as quickly shrugged and broke into a grin. If it was really that important, it would come to her. "I have a lovely idea. What do you say we all go turn in this lout together? Your assistance was instrumental in his capture, after all! Won't it be fun?" Sayen looked at each member of the party in turn, nodding enthusiastically as she did so. As Sayen enthusiastically tried to uproot Shrike from her feet as she shook her hand, the young woman laughed. If she could say anything about this world, the Sylvari were by far the most cheerful group she had met. Planet Tigers had many beings, but this was the first time she’d encountered the living embodiment of a plant. As Shrike laughed and Sayen chatted, she wondered how many of the Sylvari would love her mother’s planet. Would any of them even dare venture from their own home she wondered. “Tis a pleasure to make your acquaintance Sayen Nekane.” Shrike replied with a semblance of manners. She removed her hat from her head and stroked the feather fondly. “Tis a feather from a friend, from a far-off place.” Shrike replied almost with an air of being lost in a memory. Shrike found herself looking back into the enthusiastic eyes of the Sylvari. Ooops. She should pay more attention to drifting off like that. So many questions and fired off in such rapid succession, it made Shrike giggle inside. Yep, she liked this one, this Sayen. 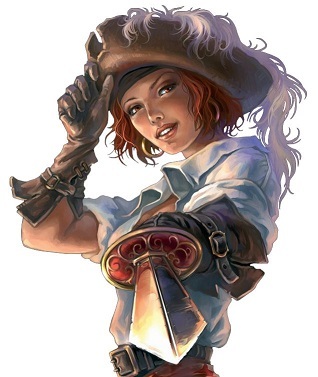 Hmm….the hat was stolen from a certain pirate long ago, not that Shrike could mention it. The saber she had acquired on one of her many journey’s. The fact that she was an alien to this world that likely had no idea of what an alien from another world was pretty much put a damper on begin able to discuss much. “The sea is my home, and anywhere there is water to sail, is home to me.” Shrike replied. The serious look on Sayen’s face didn’t rattle Shrike in the least, but she sure did need to be cautious. She never once dropped her smile from Sayen. “I will travel with you for a bit, we have need for restocking our stores.” Shrike replied. She would have to be cautious. She liked Sayen and she certainly did not want to damage the female in anyway. “After you.” Shrike smiled and bowed with another flourish of her hat. "Right-e-o! Off we go then!" Sayen pulled the raptor saddle off her own belt and tossed it into the air, bringing her own raptor back out into the light. Reaching inside the saddle bags, she pulled out a rope and promptly bound the prostrate Hassim. After a moment's consideration, Sayen cast a somewhat wicked sideways glance at the criminal before tying off the rope to the raptor's saddle. "This seems like an appropriate entrance into Amnoon for one such as you, villain! Let's go, Humphrey!" With that, the raptor began quick-marching toward the main gate of the city, dragging Hassim through every mud muddle and into every rock along the way. Sayen walked at her raptor's side, completely oblivious to Hassim's protests. She was far more interested in chatting with her company of people - whoever was in earshot, anyway. "Oh, this will be fun! We shall take this vagrant to jail, collect our reward and then purchase some celebratory juice! I do love juice. Any kind, really. Don't you? It's just so refreshing. What should we get today, Humphrey? What's that? I don't think they make juice out of fireflies. I don't know why! No need to get excited! I'll go to the mines and catch some for you myself, don't get so worked up about it. I think coconut. Come to think of it, getting juice out of a nut seems a bit odd - why is there liquid inside at all, anyway? I suppose you don't have to understand juice to like it! How lucky!" Sayen finished up her treatise on juice as the troupe reached the bounty boards. One of the bounties in particular caught the Sylvari's eye. "Hey look, Shrike! Some curmudgeon has a hat JUST like yours! What are the chances?" What the rest of the party could probably surmise from the posting was that the bounty was indeed for Shrike herself - and a rather sizable sum was emblazoned across the bottom. Thus far, no one milling about the area had noticed that "Shrike the Sly" was standing among them due to the raptor race getting underway at the gate. Shrike could not help but giggle inside. Sayen, she liked her very much in the short time they’d been around each other. It made her think of her friend of so long ago by the same name. The young female had no idea how well she’d fit into her old group of friends. Shrike also imagined Sayen would love her mother’s planet. But as far as a partner in mischief making, Shrike had a feeling the female was too devoted to justice to get involved in the kind of trouble she often found herself in. Sayen reminded her of Earth’s superheroes, especially the comics her and her friends had appropriated from the planet. She looked at the rest of the group and began to make comparisons and found herself wanting to collapse into a fit of laughter. The only sign of anything going on inside the young woman was the twinkle in her eyes. It appeared that they were walking their way into Amnoon, so Shrike fell in step next to Sayen, with Riona and LC following along. She smiled all the way, as Sayen went on about anything that popped into her mind. “Aye.” She said in agreement about the juice. Caught in her musings, Shrike looked up when Sayen called her name. There was no panic in the young women, only a dance of amusement in her eyes. She pushed her Captain’s hat back on her brow and looked at the photo, casually plucking it from the board. She showed the picture to Riona and LC, the two just looked at Shrike like she was out of her mind. Having been on this world long enough to understand the currency, Shrike whistled low at the sum of the reward, followed by the outrageous list of charges against her. All that for trying to swipe a suitable ship to get home, and from scurvy dogs that were unscrupulous. But crooks knew crooks, no matter what station they held and Shrike trying to deny most of the lies would not likely end in her favour. The ship, yes guilty as charged, the rest, trumped up charges because she’d embarrassed the wrong people. She folded the paper and put it in her pocket. Shrike didn’t know how much of the photo the others had seen, but she knew that they would not be so easily fooled. Shrike had to make a quick exit and in a way, that didn’t involve lies. Her mother had not raised a liar, but she wasn’t so sure that her new acquaintances should be opened to too much of the truth. She hadn’t ended up on this planet on purpose and she knew the consequences of revealing too much to the innocent or those not ready. Looking at her animal companions she replied. Shrike removed her hat with a flourish. Shrike turned nonchalantly and began to walk away. Last edited by Tigers; 02-11-2019 at 06:28 AM. Anakita stared back and forth at the people talking in turn as the conversation went on around her. She made no attempt to speak - nor would it have occurred to her to do so. The flow of words was like a river current she knew would be too strong for her to wade in, so she didn't try. She just watched and listened, and stared curiously at the animals, who interested her more than the people because they were easier to understand. When it finally seemed to be time to go, she stood up and motioned to her new raptor that it was time to leave. "We should head out now," she told the raptor as though speaking to a human. "It'll be faster if you let me ride, if you don't mind." She patted the animal's smooth-scaled shoulder, and then receiving what seemed to be acceptance, she climbed into the saddle.